Home / News / ‘Family’ and ‘leisure pursuits’ ranked higher than ‘health’ for heart patients. An award-winning Mayo study has been accepted for presentation at the International Palliative Care Network Conference, which runs online from November 15th – December 15th, 2018. 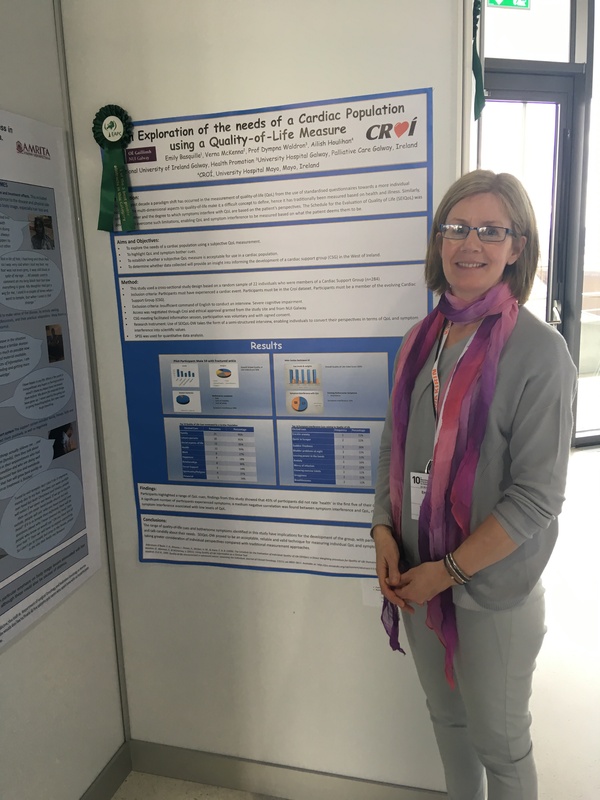 NUI Galway graduate, Emily Basquille’s study on the needs of a cardiac population, using a subjective quality of life measure, received a ribbon award last May at the 10th World Research Congress of the European Association for Palliative Care in Bern, Switzerland. Emily attended the congress with support from Marie MacCabe, principal of St. Joseph’s Secondary School, Castlebar, where Emily currently works as a Special Needs Assistant. The study, which was a collaboration between local heart & stroke charity Croí, NUI Galway and Prof Dympna Waldron of Galway University Hospital, was the first time that a subjective Quality of Life measure was tested on a cardiac population in Ireland. “Emily’s research with the Croí Cardiac Support Group has provided us with interesting insights, reinforcing our goal of putting the patient first in cardiovascular healthcare,” says Croi’s Chief Executive, Neil Johnson. The findings show that 45% of participants did not rate ‘health’ in the first five of their chosen quality of life cues, but rather selected ‘family’, ‘leisure pursuits’ and ‘social aspects of life’ as their top three most important quality of life indices. The group also experienced significant symptom interference, such as sudden tiredness and grogginess, with their Quality of Life. The study found a negative correlation between symptom interference and Quality of Life, with high levels of symptom interference associated with low levels of Quality of Life. “The results really highlight the importance of putting a patient’s perspectives and needs first, emphasising the value of taking into account a person’s Quality of Life cues when creating a personalised treatment plan,” says Basquille. Emily Basquille’s presentation at the upcoming International Palliative Care Network Poster Exhibition can be accessed at www.palliativecarenetwork.com by registering for a free account.